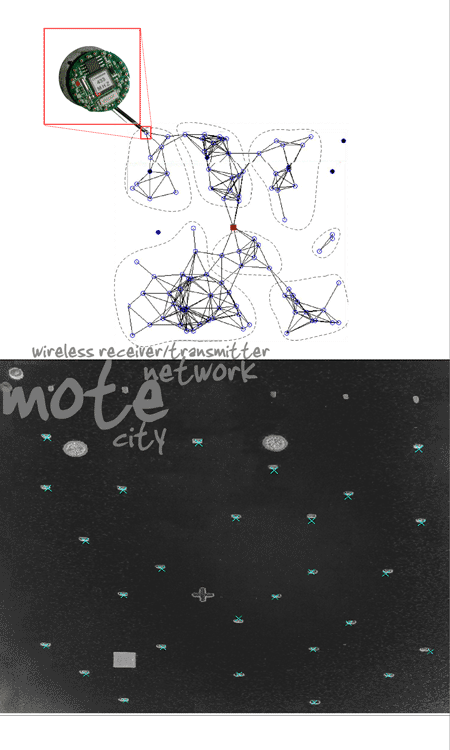 Thousands of motes can be deployed across the city for gathering data in wireless sensor networks. Used in large numbers they can communicate with one another via radio signals across the network. They can reconfigure themselves or self heal, so that the network stays stable. The data is funnelled through a system to a point where it can then be interpreted. The motes themselves can be deployed every thirty metres depending on the frequency, and any number can be place in a network. A new mote in just developed allows nine hundred metres without line of sight, suitable for a city wide proposal. Each mote can sense its own position, wake up and find its neighbour in the network. They have low energy use, but the life expectancy is determined by the battery. In the future it is imagined they will run on solar power. So the concept is to embed the city with thousands of motes to gather data for the creation of artistic artefacts. The motes can monitor sensors such as temperature, sounds, light, position, acceleration, vibration, stress, weight, pressure, humidity, and gps. The sensors take a constant stream of data which is published onto an online environment where different interface can make representations of the XML and from this lots of artistic interpretations can be imagined. The city experience is a web of connected networks and multi layered threaded paths that condition us to the emotional state of the city space. In essence, the city fabric is a giant multi user multi data sphere. To take part you really have to put something back in, that's like life. In this case, to take part you have to input data so others 'may' see the output of the data response. > what is urban computing?.